Cryo6 is intended to minimize pain and thermal injury during laser and dermatological treatments and for temporary topical anesthetic relief during injections. 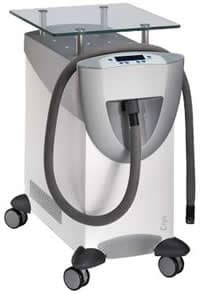 Unlike other cooling methods, such as contact cooling, cryogen spray or ice packs, the Cryo 6 can cool the epidermis before, during and after the laser energy has been applied, without interfering with the laser beam. Studies also have shown that chilling with the Cryo 6 cold air device reduces the patient’s pain sensitivity. This means much better tolerance of the treatment. 3 supplementary storage possibilities are available for user defined programs. Storage possibility is available for the user’s favorite program. This program appears when the Cryo 6 is turned on and at the conclusion of each treatment. The skin cooling system designed for superficial laser skin procedures. The Cryo 6 cold air device is intended to minimize pain and thermal injury during laser and dermatological treatments and for temporary topical anesthetic relief before injections. Unlike other cooling methods, such as contact cooling, cryogen spray or ice packs, the Cryo 6 can cool the epidermis before, during and after the laser energy has been applied, without interfering with the laser beam. Studies also have shown that chilling with the Cryo 6 cold air device reduces the patient’s pain sensitivity. This means much better tolerance of the treatment.